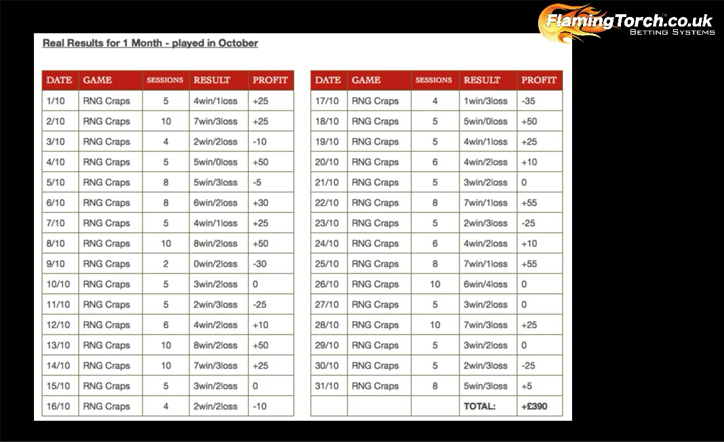 Learn how we won £390 in a Month, using our Craps System betting only £1.00 chips playing Craps! Win only £13.00 a DAY and that’s £390 a Month! This is TOTALLY DO-ABLE for anyone! The game of CRAPS can be very profitable using our Craps Betting System. Maybe you’ve IGNORED this game until now because it looks complicated? Craps is NOT COMPLICATED! If you take just a few minutes to learn the rules you’ll see there are lots of opportunities to WIN with small bets and low risk. Our system keeps it REALLY SIMPLE and you stick to a couple of simple bets. Craps is the one game that genuinely SURPRISED US – we’d ignored it for years thinking it looked difficult to learn. WE WERE SO WRONG! The rules can be learned in under 30 minutes and you can completely master the game in just a few hours. IF YOU’RE NEW TO CRAPS don’t worry – we’ll teach you everything you NEED to know and our system will show you how to profit from the game using simple bets and a brilliant strategy. Just give us 3 MINUTES and you’ll learn the basics in the video below – that’s all it takes! Craps is very easy to learn when you play smart. You can forget 95% of the table bets as the house edge it too high on them. Just stick to Pass Line or Don’t Pass bets and follow a decent betting chart – That’s IT. There is no doubling down or or mental tasks to perform – Watch this…. That wasn’t hard was it!? Place a bet before the ‘come out’ roll and wait to either win or lose that bet – not hard at all! Hopefully you can see that the game is incredibly EASY to play. We encourage you to play for fun and practice at your chosen online casino or RNG simulator so you’re completely happy with the rules of the game – Roulette and Blackjack and MUCH more difficult to learn, so if you know how to play those games, this will be a piece of cake for you! You’ve probably IGNORED it until now because it looks complicated – but it’s not. 2 of the bets have a TINY house edge of 1.41% and 1.40% – The Pass Line and Don’t Pass bets. We teach you which bet you should go for. You should play Craps because it’s easy to play and not hard to win, especially following our Betting Chart included with our system. This system makes profits & has got to be one of the easiest to use out there. You only need to remember ONE bet and follow along with a betting chart we provide. By doing this, it takes out all the guess work and you never have to think about ‘taking odds’ or remembering casino odds. This system provides a structure to your betting, maximising your wins and limiting your losses. Without this, the only smart ways to play Craps are by taking odds with your pass/don’t pass bet, or by using Dice Control methods. Both require a higher understanding of the game. It’s possible to win £390.00 in a month – which is just £13 a DAY! Betting with £1 chips. It really depends on how much you bet, how much you play and to some degree what the dice do! But I need to spell something out to you to avoid any confusion – YOU CAN WIN & PROFIT FROM THIS GAME USING OUR SYSTEM. And i’m not talking about a one-off fluke or a couple of lucky games here and there. This was our best day over the first few months of testing. 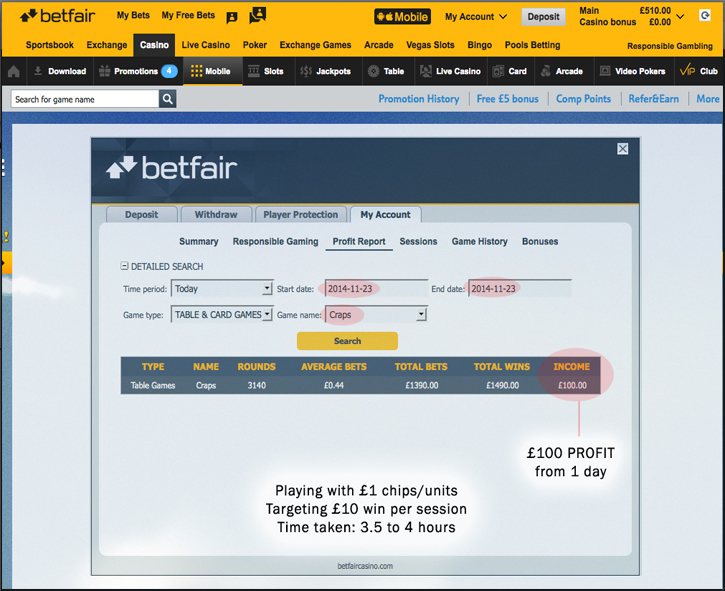 The above is a 100% GENUINE screenshot from our account playing Craps on Betfair. You can see the result – £100 in a day. You could do better or worse than this, we averaged £12.50 to £13.00 per day, or £390 a month. As you can see from our results for the month of October, we did NOT win or make a profit every single day, some days we broke even or made a loss. But that doesn’t matter because if you take the month overall and add up all the daily results, we made a profit of £390 for the month as a whole. That’s what is important. You can start with as low as £45.00 GBP (or whatever your currency is USD, EUR, AUS…) in your starting bank. With THIS system a large bankroll is not needed because we’re only placing SMALL bets each time, and our session target and stop loss is low. With £45 in the bank, we’d bet with £1 chips and aim for £10 each session. You can scale this up to whatever you’re comfortable with. We like Betfair and Bet635. But you can use any online casino that offers Craps. It’s hard to find ‘live dealer’ online Craps. RNG’s are OK. And you can use this system in ‘real’ land-based casinos. Please note: You can use this Craps Betting System at any casino (online or land-based) that offers the game of Craps. Play at ANY casino you like. This system does not use dice control. A minimum of £45. Anything over that is also fine. What will I be betting on? This is explained in the system. No, the game is actually quite simple to learn and play. The video further up this page shows you the basics. 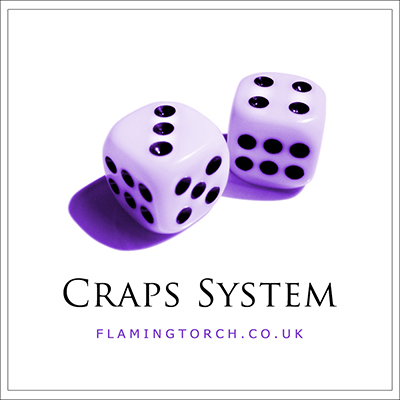 Our system just concentrates on a small part of the Craps table and is very easy to understand. You shouldn’t have any trouble following the instructions. Can I use this system at a REAL Craps table in a casino? Yes, you can. You can also use this online at any casino that offers Craps. Is this system better than your other systems? You can’t really compare them. This system is different to our other systems because every game is different and uses a different strategy. For that reason it’s hard to compare systems. Bankroll – You must have at least 45 chips to start. I was totally new to craps and wanted to learn how to make money from it. It’s the only casino game I didn’t know how to play. I wish I would of started earlier! This system gave me a step-by-step method to follow and win money from the game. It’s been very profitable so far, and I can see even more opportunities playing this game. Thanks for a great system! Let me start by saying this betting system for craps is pretty good. It’s a nice system. I like it. I’d played craps online a few times and know about most of the bets. The only problem I have is that sometimes it can take a while to make the profit in the session – it can go up and down a bit. Knowing the game, I can’t see how you can avoid this. Having said that, this system is a lot better than one I bought a few years ago from another website. And I like your videos too, they’re really easy to understand. 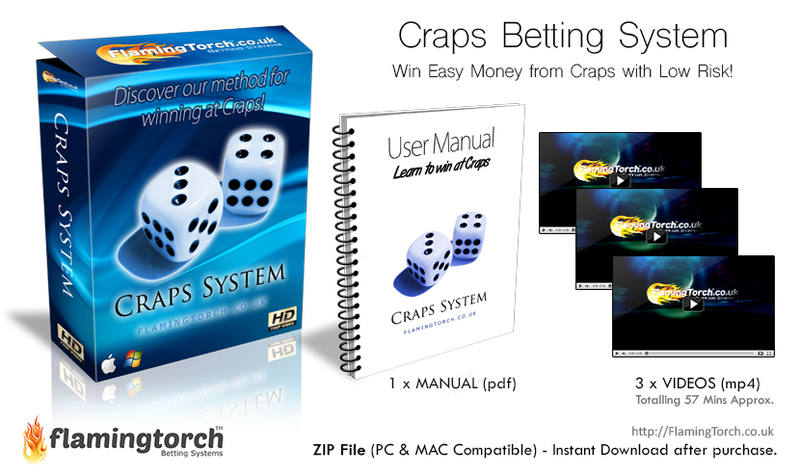 I had no prior experience with craps before getting this system. I bought it because I already use your Blackjack System and that’s very good. I wasn’t disappointed because within about 2 hours I knew the rules of the game and followed the betting chart to win my first session right away. Couldn’t have started any better! For me personally I was hoping for more. Whilst the system may be great for inexperienced users, I’ve been playing Craps for over 15 years and have seen something similar to this before. I’ve tried a lot of craps strategies and this one is somewhere between not bad and OK. It’s probably better for online users. Having not played Craps before, this was easy to understand and profitable right from the first game for me. The craps table is bloated by lots of long shot bets, which this system thankfully ignores completely. I’d recommend this to anyone looking to make money from Craps. START MAKING MONEY FROM CRAPS BY PLAYING WITH OUR CRAPS SYSTEM TODAY! GET IT NOW! Download your copy of our Craps System today and learn how to make money from Craps with our easy to follow Instructional Videos & Manual. Click the Add to Cart button below.